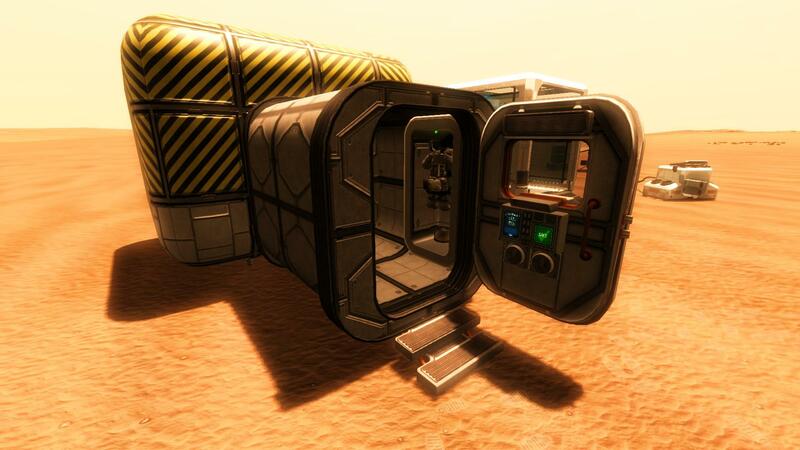 This step-by-step guide will show you how to properly pressurize an Outpost-Style habitat. 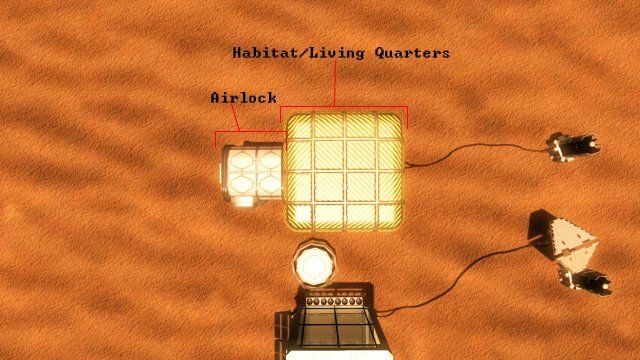 So you've finished building your habitat as shown in the screenshot below and now you want to pressurize it so you can work and live comfortably on Mars. Before we continue will need to make a checklist so we know the inside is ready to go. 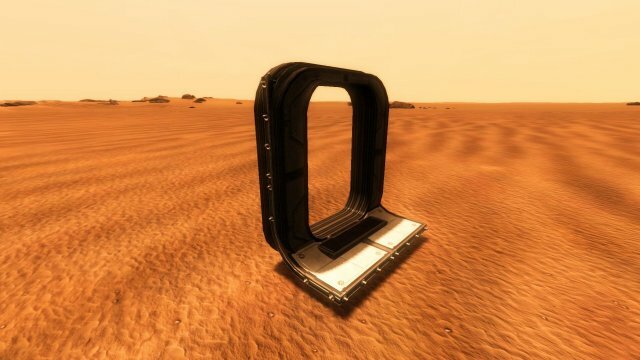 We need a 'Barrel Slot' wall piece, this will hold our barrels of O2, CO2 or Nitrogen. We need a 'Life Support Module', this will provide O2, CO2 or Nitrogen to the habitat. We need a 'Power Socket' wall piece, this will provide power to the habitat. 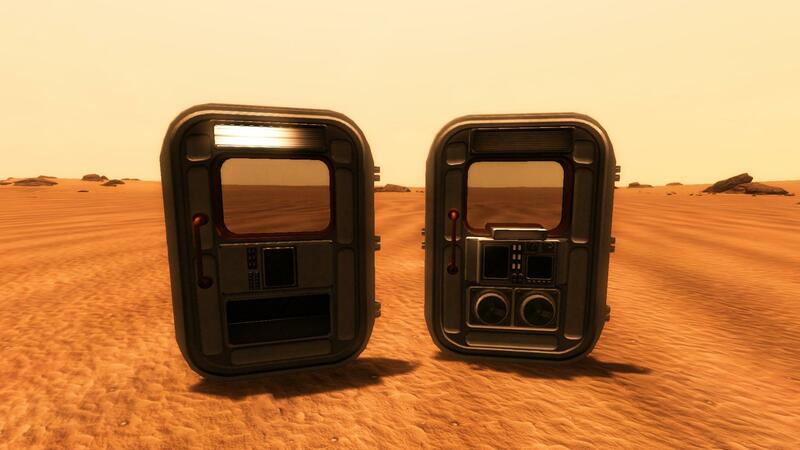 Referring to the screenshot above we can see these 'machines' on the back wall. Our 'Barrel Slot' wall piece is on the right side and has barrels loaded onto it. 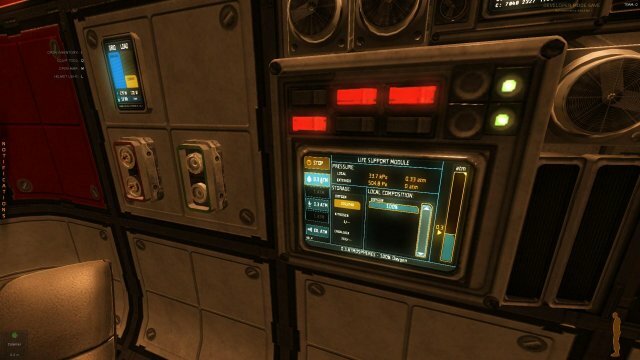 Our 'Life Support Module' is on the left side wall, has power and is functioning fine. Our 'Power Socket' wall piece is also on the left side next to the Life Support Module. 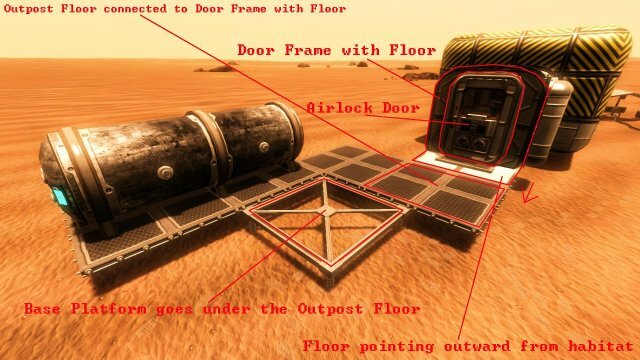 A 'Door Frame with Floor' attaches to the floor below. (The white part connects to our 'Floor' piece). An 'Airlock Door' is attached to the 'Door Frame with Floor'. On the outside of the habitat we attach a 'Corridor' piece to the opposite side of the 'Door Frame with Floor' piece. Then once we've made the corridor as long as we want using 'Corridor' pieces, we close it off with a 'Door Frame' and then an 'Airlock Door'. 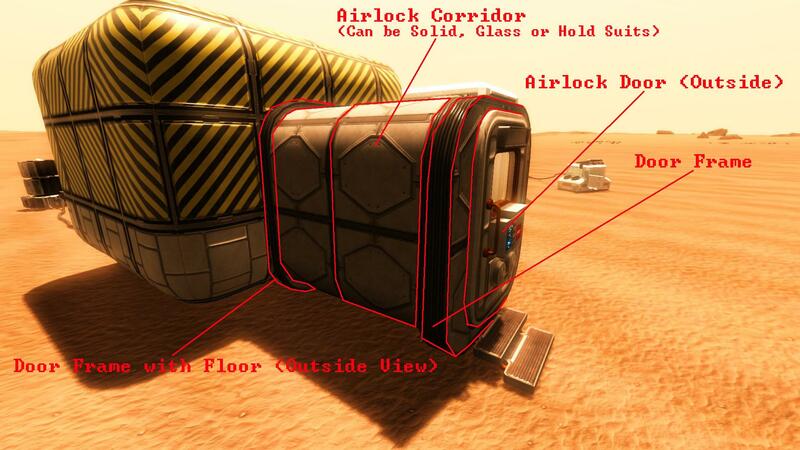 The screnshot below shows an 'Airlock Door' opening correctly outward after being placed. Now that we've prepped both the inside and outside of our habitat it's time to pressurize it. Go back inside your habitat and face the inner door. Inside our habitat and facing the inner door. In the screenshot above you can see we're back inside and we've left the inner door open. 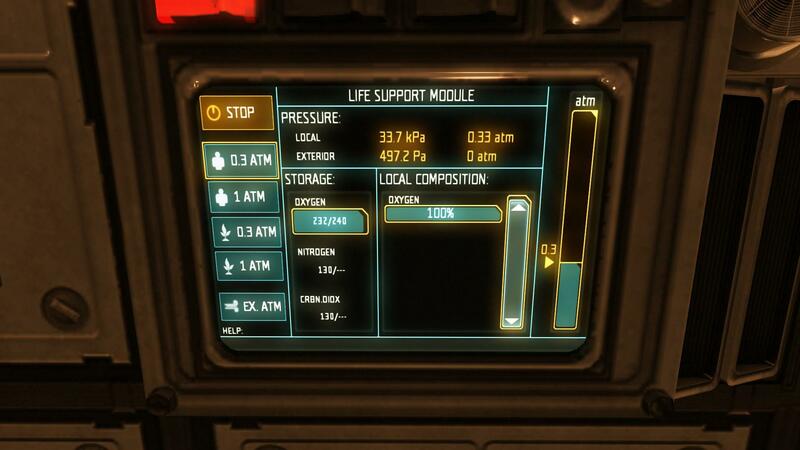 Now we need to look at the 'Life Support Module'. 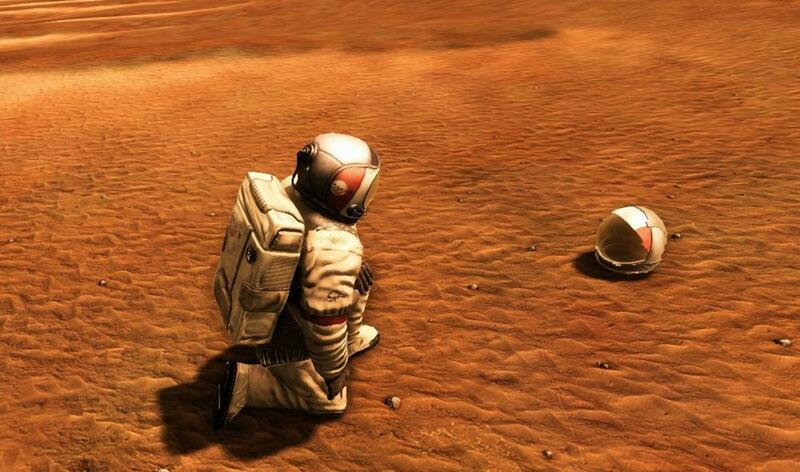 Looking at the 'Life Support Module'. 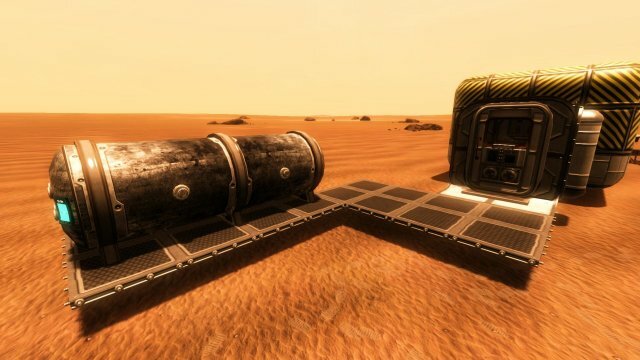 This setting will start filling your barrels (or huge resource tank) with the atmosphere of Mars. Mostly O2, CO2 and Nitrogen. 320/1254 - The number on the left is how much of said resource you have (O2, CO2 or Nitrogen). The number on the right shows the required amount of resources needed (O2, CO2 or Nitrogen) to fill and pressurize the habitat. The current mixture of gases inside the habitat. 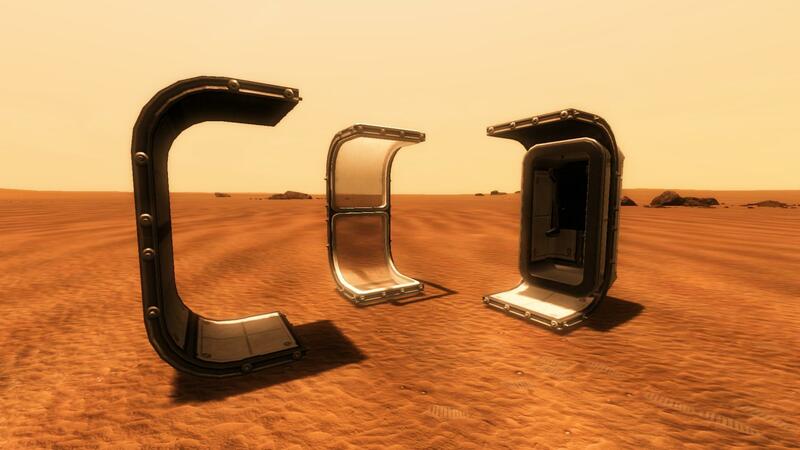 If these are randomly changing the habitat is filled with martian atmosphere. Is there a difference between the two settings Human or Plant? No. 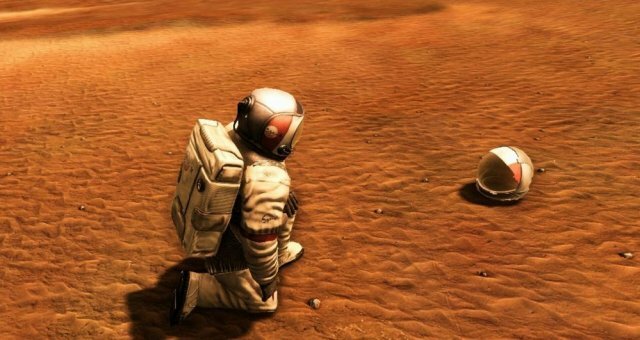 You can use either human or plant setting to pressurize the habitat. This might change as Dram said the 'Plant' settings were suppose to make you dizzy/sick cause of the added gases. But at the moment you can use either one without any issues. Step 5 - That's All Folks! 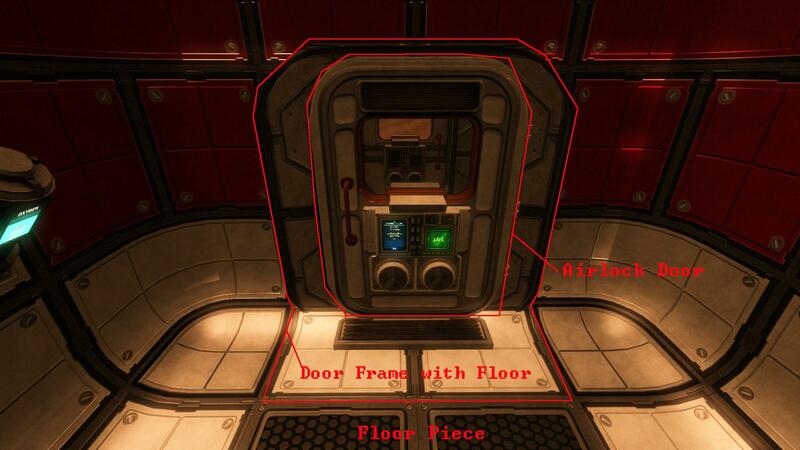 After selecting whichever atmosphere (Human or Plant) turn back around and face the airlock again. Facing the airlock after selecting an ATM on the Life Support Module. At this point you should see the words 'EXT. SAFE' on your suit HUD. You should now be able to remove your suit. If you want to go outside now you just need to enter the airlock, close the door behind you, walk over to the outer door and push the 'Cycle' button on the airlock door. 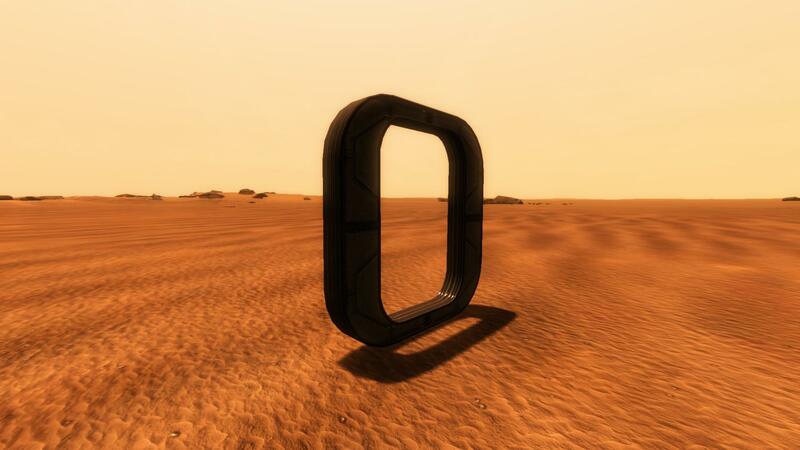 This will depressurize the 'airlock' and leave the habitat behind us pressurized. Don't forget your suit! The huge resource tank can also be used to provide resources to the habitat. The screenshot below shows how to attach them properly. A 'Huge Resource Tank' attached and providing Oxygen to our habitat. This screenshot shows us 'how' it's all done. The following are screenshots showing the different parts used in this guide. Corridors - Solid, Glass and Suit Holder. 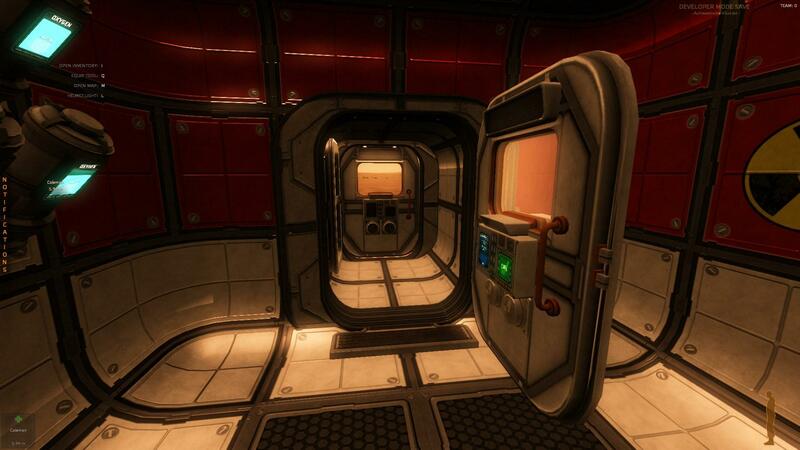 A door (L) and an Airlock door (R) - Don't mix these up! 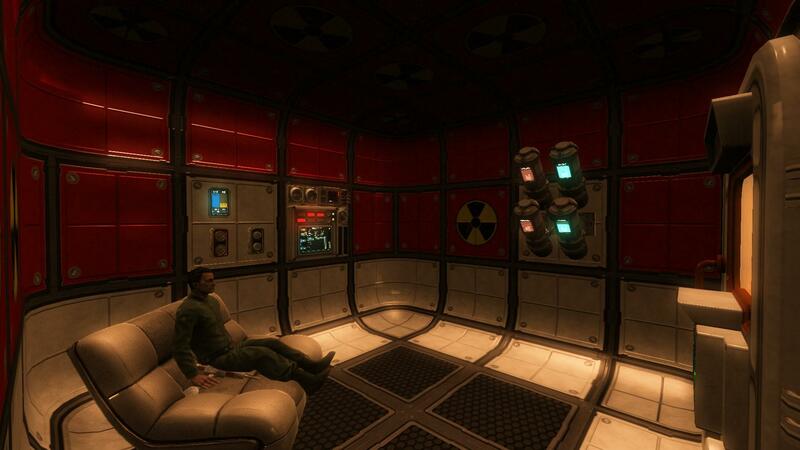 An Airlock and Habitat/Living Quarters.